The first lost of the season is always a bummer. At least it wasn’t on Opening Day this year. The Yankees dropped their first game of the 2018 season Saturday afternoon, falling 5-3 to the Blue Jays. A loss is a loss. There’s another 55-75 of these to come. But, to make matters worse, the Yankees lost both Billy McKinney (shoulder) and Adam Warren (ankle) to injury. The injuries are piling up. 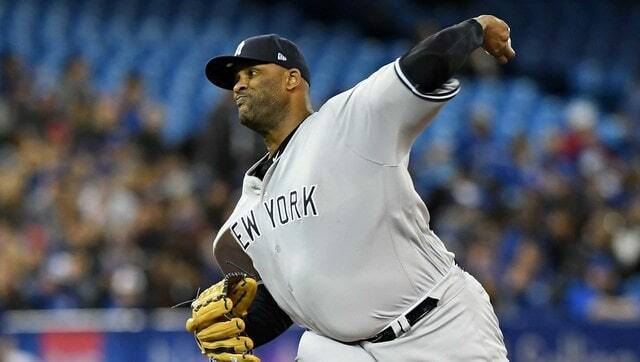 The late career CC Sabathia experience was in full effect Saturday afternoon. Lots of bending, little breaking, plenty of moments that made you wonder how he’d ever get another out, and five solid innings. Two runs, one earned. Sabathia’s afternoon ended when he coaxed an inning-ending 5-4-3 double play from Yangervis Solarte with two runners on base and the teams tied at two. You could tell it was his final batter regardless of outcome. 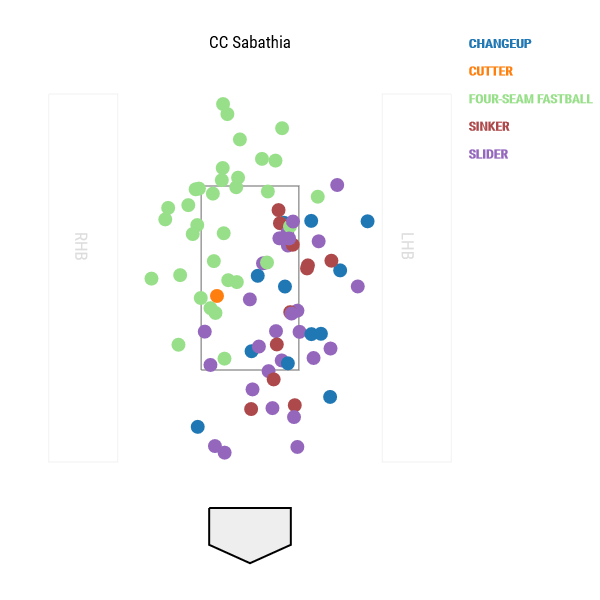 The Blue Jays loaded their lineup with right-handers against Sabathia — they had seven righties and two switch-hitters in the starting lineup — which plays right into his cutters in/soft stuff away approach. Here are Sabathia’s pitch locations. Cutters in — Statcast has been classifying his cutter as a four-seamer since last year for whatever reason — and sliders and changeups away. Toronto jumped on Sabathia early, with Josh Donaldson banging a double off the left field wall and Justin Smoak driving him in with a single to left. That gave the Blue Jays a 1-0 lead in the first inning. In the third, Steve Pearce reached on a combo error by Brandon Drury and Tyler Austin. Drury’s throw short-hopped and Austin couldn’t make the scoop. I thought it was a play a big league first baseman should make. Error went to Drury. Those two runs were all the Blue Jays would get during Sabathia’s five innings. He threw 84 pitches and Aaron Boone had Warren warming up before Sabathia’s pitch count hit 75, his magic number. Things tend to go south for the big man once he reaches 75-80 pitches. Two runs (one earned) in five innings on 84 pitches is the quintessential Sabathia start at this point of his career. The Yankees are built around youth now, particularly young power bats, and Austin has been in the organization longer than most of them. The 2010 13th round pick only made the Opening Day roster because of Greg Bird’s injury, and Saturday he made a rare start against a right-handed pitcher. Austin went into the game as a career .184/.228/.333 (45 wRC+) hitter with 41.3% strikeouts in fairly limited time against big league righties. Yikes. The two homers came on nearly identical pitches. An 89.5 mph four-seamer and an 88.3 mph four-seamer, both on the inner half. Good to see the Yankees get some more offense from the bottom of the lineup, but Austin went 2-for-3 with two homers and the rest of the Yankees went 2-for-27 (.074) with two doubles. Giancarlo Stanton and Didi Gregorius had the two-baggers. Once Aaron Judge and Gary Sanchez get settled in, the offense will light it up. First weird managerial move of the Boone era. Warren started the sixth inning, walked Kevin Pillar with one out, and Pillar moved to second on a fielder’s choice. Warren then took a comebacker to the ankle that knocked him out of the game, and in the sixth inning of a tie game, the next guy out of the bullpen was … Jonathan Holder? Jonathan Holder. The eighth reliever in the eight-man bullpen. Holder threw a cement mixer, the dangerous Luke Maile dunked a single to left, and the Blue Jays took a 3-2 lead. (1) That’s two homers allowed in two appearances for Betances. This one came on a 2-0 fastball out over the plate, and Solarte pimped it like a five-time All-Star rather than a dude who spent ten years in the minors before getting a big league chance. Live it up, man. 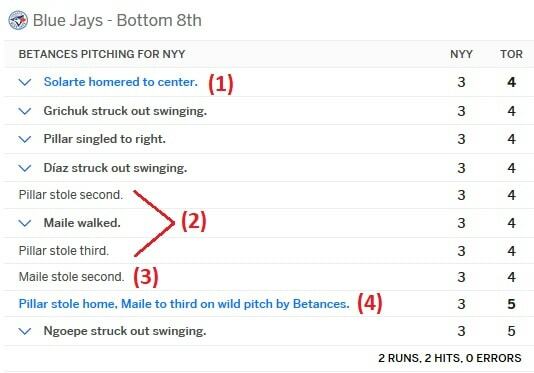 Betances allowed his second home run on September 4th last season, by the way. (2) Pillar poked a ground ball single by Austin at first base, then stole second. You knew that was coming. Teams know they can run on Dellin. Sanchez was able to throw out Curtis Granderson in the previous inning. This time he didn’t even attempt a throw on Pillar. Pillar then stole third, again without a throw. The go-ahead run was at third with two outs. (3) Maile, the slow-footed catcher, stolen second following the walk hoping Sanchez would throw through, allowing Pillar to come home from third. Gary didn’t fall for it. He faked the throw to second and looked Pillar back to third. It goes into the record book as a stolen base, but I’m glad Sanchez didn’t throw down. That’s what the Blue Jays wanted. They would’ve tried that with any pitcher on the mound. (4) This … was bad. Pillar was way down the line, first trying to goad Betances into a balk, then flat out breaking for the straight steal of home. Dellin made a quick non-competitive throw to the plate and Pillar slid in for the insurance run. Yikes. Four stolen bases in the inning, and even though one was not really a steal because the Blue Jays were hoping Maile would get caught in a rundown when Sanchez threw to second, that’s still terrible. The stolen bases are Dellin being Dellin though. But two homers in two outings? Like I said, I thought Green was coming into the 3-3 tie in the eighth inning. He was warming up and I figured Boone would get Betances out of the game feeling good about things after striking out two in the scoreless seventh inning. The Yankees have to rebuild Dellin’s confidence after late last season and that seemed like a good opportunity to get him out of there after an effective outing. Going to Holder and asking Betances to throw a second inning weren’t the best decisions by the rookie manager. Righty reliever Ryan Tepera very clearly pitched around Stanton with two outs and the bases empty in the seventh inning of a tie game, and Gregorius popped up on the first pitch to end the inning. Even if stacking the righties doesn’t prevent those unintentional intentional walks, Sanchez is better able to make teams pay for those decisions. That’s my “bat the righties back-to-back-to-back” rant of the day. McKinney exited the game in the first inning after crashing into the left field wall on Donaldson’s double. He’s going to miss a few weeks and Miguel Andujar was recalled. I get the feeling we’re going to see Judge in center field a bit more often now, at least unless Jacoby Ellsbury returns. Judge only had to make one play in center this afternoon and it was as routine as it gets. No tough plays Saturday. Also, Warren exited the game after taking a comebacker to the right ankle and it sounds like he escaped without a serious injury. X-rays came back negative and he has a bruise. It’s unclear how long he’ll be sidelined, but with an eight-man bullpen, the Yankees have no shortage of arms. One more game before the Yankees come home to the Bronx. They’ll wrap up this four-game season-opening series with the Blue Jays on Sunday afternoon. That’s a 1:07pm ET start. Sonny Gray and Marcus Stroman are the scheduled starters. I wonder how long it’s been since two right-handed starters 5-foot-10 or shorter matched up?